Judaizers is a term for Christians who insist that their co-religionists should follow the Law of Moses. This term is most widely known from its single use in the Greek New Testament (Galatians 2:14) where Paul publicly challenges Peter for compelling gentile converts to Early Christianity to "judaize", also known as the Incident at Antioch. This term includes groups who claim the necessity of continued obedience to the Law of Moses found in the first five books of the Old Testament. Members of such groups, notably the Seventh-day Adventist Church, dispute the use of the term because "Judaizers" is typically used as a pejorative. Most Christians believe that much of the Old Covenant has been superseded, while some modern Protestants believe it has been completely abrogated and replaced with the Law of Christ. The Christian debate over Judaizing began in the lifetime of the apostles, notably at the Council of Jerusalem and the Incident at Antioch. It has been carried on parallel to continuing debates about Paul the Apostle and Judaism, Protestant views of the Ten Commandments, and Christian ethics. The meaning of the verb Judaize, from which the noun Judaizer is derived, can only be derived from its various historical uses. Its Biblical meaning must also be inferred and is not clearly defined beyond its obvious relationship to the word "Jew." The Anchor Bible Dictionary, for example, says: “The clear implication is that gentiles are being compelled to live according to Jewish customs." And the Jews had light and gladness, in every city and province wherever the ordinance was published: wherever the proclamation took place, the Jews had joy and gladness, feasting and mirth: and many of the Gentiles were circumcised, and became Jews, for fear of the Jews. (Brenton Translation). ...when the Syrians thought they had ruined the Jews, they had the Judaizers in suspicion also (Whiston Translation). When a man named Caecilius, one of the freed slaves, who was said to be given to Jewish practices, would have put by the Sicilians, and undertaken the prosecution of Verres himself, Cicero asked, "What has a Jew to do with swine?" verres being the Roman word for a boar. (Dryden Translation). Besides other taxes, that on the Jews [A tax of two drachmas a head, imposed by Titus in return for free permission to practice their religion; see Josephus, Bell. Jud. 7.6.6] was levied with the utmost rigor, and those were prosecuted who, without publicly acknowledging that faith, yet lived as Jews, as well as those who concealed their origin and did not pay the tribute levied upon their people [These may have been Christians, whom the Romans commonly assumed were Jews]. I recall being present in my youth when the person of a man ninety years old was examined before the procurator and a very crowded court, to see whether he was circumcised. (Suetonius on Domitian 12.2, Rolfe Translation). It is absurd to profess Christ Jesus, and to Judaize. For Christianity did not embrace Judaism, but Judaism Christianity, that so every tongue which believeth might be gathered together to God. (Roberts-Donaldson Translation). There are several direct interpolations by a later forger regarding anti-Judaizing in Ignatius's epistles that are considered authentic, it can be assumed the redactor was either trying to build upon Ignatius' positions or responsible for what is perceived as Ignatius' anti-Judaizing altogether. And Pilate, summoning the Jews, says to them: You know that my wife is a worshipper of God, and prefers to adhere to the Jewish religion along with you... Annas and Caiaphas say to Pilate: All the multitude of us cry out that he [Jesus] was born of fornication, and are not believed; these [who disagree] are proselytes, and his disciples. And Pilate, calling Annas and Caiaphas, says to them: What are proselytes? They say to him: They are by birth children of the Greeks, and have now become Jews. (Roberts-Donaldson Translation). The Synod of Elvira of around 306 prohibited Christians from marrying, worshipping with, or publicly eating with Jews, pagans and heretics. Christians must not judaize by resting on the Sabbath, but must work on that day, rather honouring the Lord's Day; and, if they can, resting then as Christians. But if any shall be found to be judaizers, let them be anathema from Christ. (Percival Translation). Distinct uses of the term "Judaizers"
That Gentile Christians should convert to Judaism and obey the Laws of Moses was the assumption of some in the Early Church, as represented by Pharisees who had become believers in Acts 15 (Acts 15:5). This was the Jewish Christian version of the opinion within Judaism that Gentiles should convert to Judaism in order to be right with God (see convert to Judaism). Paul opposed this position, with a Jewish Christian version of the opposite opinion in Judaism, concluding that Gentiles did not need to convert and obey the entire Law of Moses. See also Hellenistic Judaism. This conflict between Saint Paul and his opponents was the reason for the Council of Jerusalem (see Acts 15:1–35). Here James, Paul, and the other leaders of the early Christian movement agreed that Gentile converts needed only to follow the "three exceptions" (Acts 15:20,29; counted by some as four), laws that roughly coincide with Judaism's Seven Laws of Noah said to be established by God for all humankind (see also Genesis 9:1–17). This Apostolic Decree, still observed in full by the Orthodox Church (which does not interpret the decree as requiring the use of kosher meat), is similar to that adopted by Rabbinic Judaism, which teaches that Gentiles need follow only the Noachide Laws to be assured of a place in the World to Come. See also Dual-covenant theology. The "three exceptions" resolved by the Council of Acts 15 indicate that the apostles accepted that those portions of the Law of Moses (the Torah) intended for Gentiles (later known as the Laws of Noah) would apply to Gentile Christians. Extra-Biblical evidence shows that, at least in some areas (especially in the East), this included observances beyond the three exceptions, such as a Christianized form of Passover, Day of Atonement, and Sabbath. But other Gentile Christian communities (especially in the West), evolved in an increasingly anti-Jewish direction that interpreted Paul's teaching to mean that all Torah Laws are redundant "now that Salvation by Faith is available through Jesus' atoning death". From this latter point of view, any practice associated with Judaism came to be seen as a rejection of God's salvific gift, even the prohibition of blood which is listed among the "three exceptions" in Acts 15 (though the prohibition of blood was rejected only in the Western Church and not until the Middle Ages). While Acts 15 gives an example of what new Believers were subject to when entering the house of God, verse 21 states that the Gentiles would learn the ways of Moses in the way it has been done. The prohibitions against fornication and idolatry are still observed by most Christian denominations although these appear in Jewish law. See also Antinomianism and Marcionism and The Law of Christ. “Probably the best description of Judaizers is in Acts 15:1: "And certain men came down from Judea and taught the brethren, and said, 'Unless you are circumcised according to the custom of Moses, you cannot be saved. '… Circumcision performed for the purpose of being "saved" meant a full, formal conversion to Judaism, complete with a baptism into Judaism and an embracing of the rabbis' entire Oral Law (probably the law that Peter had in mind when he referred to "a yoke ... which neither our fathers nor we were able to bear) ... The Judaizers believed that this conversion process would turn the Gentile believer into a full-fledged Jew, and that without this the Gentile could not be saved. Without a complete, formal conversion to Judaism, the Gentile believer could not become a full-fledged member of the saved Messianic Community, the Judaizers said ... No Scripture-loving Jew could describe the written Torah as an unbearable yoke. See Psalm 19 and Psalm 119." This behavior was particularly persecuted from 1300 to 1800 during the Spanish and Portuguese Inquisitions, using as a basis the many references in the Pauline epistles regarding the "Law as a curse" and the futility of relying on the Law for attaining salvation, known as legalism. Thus, in spite of Paul's agreement at the Council of Jerusalem, Gentile Christianity came to understand that any Torah Laws (with the exception of the Ten Commandments and Natural Law) were anathema, not only to Gentile Christians but also to Christians of Jewish extraction. Under the Spanish Inquisition, the penalty to a converted Jew for "Judaizing" was usually death by burning. The Latin verb iudaizare is used once in the Vulgate where the Greek verb ioudaizein occurs at Galatians 2:14. Augustine in his Commentary on Galatians, describes Paul's opposition in Galatia as those qui gentes cogebant iudaizare - "who thought to make the Gentiles live in accordance with Jewish customs." The Spanish verbal participle Judaizante was applied both to Jewish conversos to Catholicism who practiced Judaism secretly and sometimes to Jews who had not converted, in Spain and the New World at the time of the Spanish Inquisition. It is widely held that Paul accused Judaizers of teaching that observance of the Abrahamic ritual was necessary to be justified and hence saved, i.e. Legalism, (see also Circumcision controversy in early Christianity and for a counterview, see New Perspective on Paul). The relationship of Paul of Tarsus and Judaism is still disputed today. These groups taught that Gentile followers of Jesus needed to become Jewish proselytes and by so doing also observe the various requirements of the written Torah. According to Eusebius' History of the Church 4.5.3-4: the first 15 Bishops of Jerusalem were "of the circumcision", although this in all likelihood is simply stating that they were Jewish Christians (as opposed to Gentile Christians), and that they observed Biblical circumcision and thus likely the rest of Torah as well. The issue was an early source of controversy in the church, with the issue coming to a head during the Council of Jerusalem. According to the account given in Acts 15, it was determined that Gentile converts to Christianity did not have to go through circumcision to secure a place in the World to Come; but in addressing the second question as to whether or not they should obey the Torah, they encouraged the Gentiles to "abstain from things sacrificed to idols, and from blood, and from things strangled, and from fornication,"
Also Paul warned the early Galatian church that Gentile Christians who submit to circumcision will be alienated from Christ: "2 Indeed I, Paul, say to you that if you become circumcised, Christ will profit you nothing. 3 And I testify again to every man who becomes circumcised that he is a debtor to keep the whole law. 4 You have become estranged from Christ, you who attempt to be justified by law; you have fallen from grace." (Galatians 5:2–4). The Epistle to Titus 1:11, often attributed to Paul, is, according to some Biblical scholars, also a condemnation of these practices. Paul is against only the practice of circumcising oneself, and this is not actually a Law in the Torah, as the Law is to circumcise one's son, hence is why he brings up the issue of Abraham. It is commonly mistaken that Paul is grouping all of Jewish Law with the unrequired self-circumcision that the "Circumcision Faction" was attempting to press on fresh converts. But Paul clearly says that the Law is to be upheld. (Romans 2:13, 3:31, Galatians 3:12). The influence of the Judaizers in the church diminished significantly after the destruction of Jerusalem, when the Jewish-Christian community at Jerusalem was dispersed by the Romans during the Great Jewish Revolt. The Romans also dispersed the Jewish leadership in Jerusalem in 135 during the Bar Kokhba Revolt. Traditionally it is believed the Jerusalem Christians waited out the Jewish–Roman wars in Pella in the Decapolis. These setbacks however didn't necessarily mean an end to Jewish Christianity, any more than Valerian's Massacre of 258, (when he killed all Christian bishops, presbyters, and deacons, including Pope Sixtus II and Antipope Novatian and Cyprian of Carthage), meant an end to Roman Christianity. 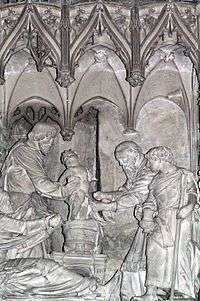 Circumcision of Jesus, sculpture in the Cathedral of Chartres. Christian groups following Jewish practices never completely vanished, although they had been designated as heretical by the 5th century. Old Testament practices are still adhered to among Gentiles to this day, including circumcision (see also Biblical law in Christianity). The Coptic churches continue to practice circumcision,. but critics charge this may reflect ancient Egyptian influence or be a response to the culture of the Islamic majority (see also Abrahamic religions and Circumcision controversy in early Christianity). In Torah-submissive Christian groups which include the Ethiopian Orthodox church, dietary laws and Saturday Sabbath are observed as well. R. Emden (), in a remarkable apology for Christianity contained in his appendix to "Seder 'Olam" (pp. 32b-34b, Hamburg, 1752), gives it as his opinion that the original intention of Jesus, and especially of Paul, was to convert only the Gentiles to the seven moral laws of Noah and to let the Jews follow the Mosaic law— which explains the apparent contradictions in the New Testament regarding the laws of Moses and the Sabbath. Coptic Orthodox and Ethiopian and Eritrean Orthodox Churches continue to practice male circumcision. It was no mere school for the learned, disclosed no mysteries for the privileged, but sought to lay the foundation of the Christian community on the pure gospel, the authentic institutes of Christ. The pure gospel, however, Marcion found to be everywhere more or less corrupted and mutilated in the Christian circles of his time. His undertaking thus resolved itself into a reformation of Christendom. This reformation was to deliver Christendom from false Jewish doctrines by restoring the Pauline conception of the gospel, Paul being, according to Marcion, the only apostle who had rightly understood the new message of salvation as delivered by Christ. In Marcion's own view, therefore, the founding of his church—to which he was first driven by opposition—amounts to a reformation of Christendom through a return to the gospel of Christ and to Paul; nothing was to be accepted beyond that. This of itself shows that it is a mistake to reckon Marcion among the Gnostics. A dualist he certainly was, but he was not a Gnostic. But like the Gnostics, Marcion believed that the Jewish God Yahweh had created the world, was lesser in status to the unreachable higher God, and was evil (see also Dualism). Against this view, Irenaeus of Lyons's Against Heresies 3.12 section 12 ridiculed those who think they are wiser than the Apostles because they were still under Jewish influence. The Judaizing teachers were a group of Jewish Christians who taught that converts to Christianity must first be circumcised (i.e. become Jewish through the ritual of a proselyte) in order to observe the Law of Moses (as well as the oral traditions of the authorities making the proselyte ritual mandatory for Gentiles to secure a place in the World to Come) in order to be justified. This group was very active in the church of the 1st century AD prior to the destruction of the Temple of Jerusalem in the Great Jewish Revolt. Although such requirements may have made Christianity a much less appealing religious choice for some Gentiles, the evidence afforded in Paul's letter to the Galatians exhibits that a significant number of the Galactic Gentile converts appear readily disposed to adopt these nomistic requirements; indeed, Paul strenuously labors throughout the letter (cf. Gal 5:4; 4:21; 5:2,3) to dissuade them from doing so. Paul saw these teachers as being both dangerous to the spread of Christianity and propagators of grievous doctrinal error. Many of his letters included in the New Testament (the Pauline epistles) contain considerable material disputing the view of this group and condemning its practitioners. In 2 Corinthians 11:5 and 12:11 he called his opponents super-apostles. Also, in 2 Corinthians 11:13 -15 Paul refers the Judaizers as False Apostles. Paul publicly condemned Peter for his seemingly ambivalent reaction to the Judaizers, embracing them publicly in places where their concepts were popular while holding the private opinion that the teachings were erroneous, for example 1 Cor 9:20–23. The Catholic Encyclopedia: Judaizers notes: "Paul, on the other hand, not only did not object to the observance of the Mosaic Law, as long as it did not interfere with the liberty of the Gentiles, but he conformed to its prescriptions when occasion required (1 Corinthians 9:20). Thus he shortly after circumcised Timothy (Acts 16:1–3), and he was in the very act of observing the Mosaic ritual when he was arrested at Jerusalem (21:26 sqq.)." Judaizing teachers are even more strongly condemned in the Epistle of Barnabas. 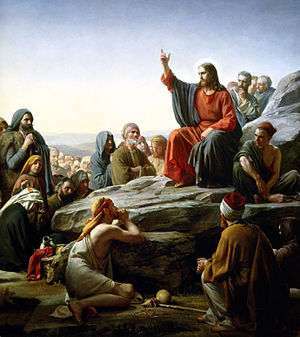 (Although it did not become part of the Christian Biblical canon, it was widely circulated among Christians in the first two centuries and is part of the Apostolic Fathers.) Whereas Paul acknowledged that the Law of Moses and its observance were good when used correctly ("the law is good, if one uses it lawfully", 1 Tim 1:8), the Epistle of Barnabas condemns most Jewish practices, claiming that Jews had grossly misunderstood and misapplied the Law of Moses. The eight homilies Adversus Judaeos ("against the Jews") of John Chrysostom (347 – 407) deal with the relationship between Christians, Jews and Judaizers. The letter to the Galatians strongly influenced Martin Luther at the time of the Protestant Reformation because of its exposition of Justification by Grace. See also Law and Gospel. ↑ Greek New Testament, Galatians 2:14 ἀλλ᾽ ὅτε εἶδον ὅτι οὐκ ὀρθοποδοῦσιν πρὸς τὴν ἀλήθειαν τοῦ εὐαγγελίου εἶπον τῷ Πέτρῳ ἔμπροσθεν πάντων Εἰ σὺ Ἰουδαῖος ὑπάρχων ἐθνικῶς ζῇς καὶ οὐκ Ἰουδαϊκῶς τί τὰ ἔθνη ἀναγκάζεις Ἰουδαΐζειν. ↑ Michele Murray Playing a Jewish game: Gentile Christian Judaizing in the first and Second Centuries CE, Canadian Corporation for Studies in Religion - 2004 p33 "From Paul's perspective, by withdrawing from Gentile table fellowship, Peter was sending a message to the Gentile believers of Antioch. The message to Antiochene Gentile Christians was that they were to judaize." ↑ Marsh, Ernest, C. (2011). "The Septuagint versus the Masoretic - Esther - Chapter 8". ECMarsh.com The Common Man's Prospective. ↑ "Flavius Josephus. The Wars Of The Jews. Book II, chapter 8.14" Archived April 28, 2005, at the Wayback Machine. ↑ "Flavius Josephus, The Wars of the Jews", William Whiston, A.M., Ed., John E. Beardsley. 1895. Book II, Whiston Section 461. Tufts.edu, Tufts University. ↑ "The Internet Classics Archive | Cicero by Plutarch". Classics.mit.edu. Retrieved 2011-09-16. ↑ Halsall, Paul (October 2000). "Ancient History Sourcebook: Suetonius: De Vita Caesarum--Domitianus, c. 110 C.E. Translated by J. C. Rolfe.". Fordham University. ↑ "St. Ignatius of Antioch to the Magnesians (Roberts-Donaldson translation)". Earlychristianwritings.com. 2006-02-02. Retrieved 2011-09-16. ↑ "Ante-Nicene Fathers, Vol. VIII". Earlychristianwritings.com. Retrieved 2011-09-16. ↑ "A Short History of Canon Law from Apostolic Times to 1917 - The Council of Elvira, ca. 306". Ken Pennington, Ken, The Catholic University of America. ↑ "NPNF2-14. The Seven Ecumenical Councils | Christian Classics Ethereal Library". CCEL.org. 2005-06-01. Retrieved 2011-09-16. ↑ Daniel Botkin. 2001, March–April. Who Were the Judaizers? Gates of Eden. ↑ Eric Plumer Augustine's Commentary on Galatians: Introduction, Text, Translation, and Notes p124 footnote "5 Literally, 'who were compelling Gentiles to Judaize (Latin: iudaizare)'—in other words, '... to live in accordance with Jewish customs'. In the Latin Bible the term occurs only at Gal. 2: 14, where it virtually transliterates the Greek ioudaizein"
↑ Seymour B. Liebman The inquisitors and the Jews in the New World 1975 "The term Judaizante was applied to Jewish apostates to Catholicism who practiced Judaism secretly. In some instances the term was synonymous with Jew." ↑ Zumárraga and the Mexican Inquisition, 1536-1543 "The first activity of the Mexican Inquisition against Jews and Judaizantes came in 1523 with the ordinance against heretics and Jews." ↑ McGrath, Alister E. Christianity: An Introduction. Blackwell Publishing (2006). ISBN 1-4051-0899-1, page 174. ↑ "The Ethiopian Orthodox Tewahedo Church". cnewa.org. Catholic Near East Welfare Association. Retrieved 31 October 2015. Look up Judaization in Wiktionary, the free dictionary.